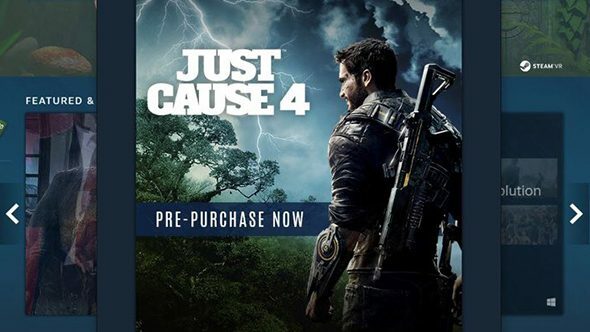 Just Cause 4 is on the way, as one leak springs on the good ship we’re sailing into E3. A Steam promo image popped onto the service earlier this evening, revealing the fourth entry in the series of sandbox explosion simulators, which is likely scheduled for a proper unveiling next week – unless Avalanche, like so many studios in the past few weeks, shrugs at the leaks and does their reveal early. Some games are announced before being revealed to the world. For details on those, check out our list of upcoming PC games. The promo, which was first captured by Steven Oz on Twitter, also shows a Square Enix copyright notice, suggesting that they’ll continue to handle publishing duties for independent developer Avalanche. Square Enix hosts their E3 showcase Monday, June 11 at 10:00 PDT / 13:00 EDT / 18:00 BST. For early rumours of release dates and multiplayer, click here to catch up on everything we know about Just Cause 4 so far, and everything we wantto see. Maybe this means there’s hope that a new Splinter Cell could be on the way after all. We’ll find out for sure next week at E3, likely along with further details on Just Cause 4, assuming it doesn’t all leak beforehand.